For IEC Testing of residual voltage after plug disconnect. 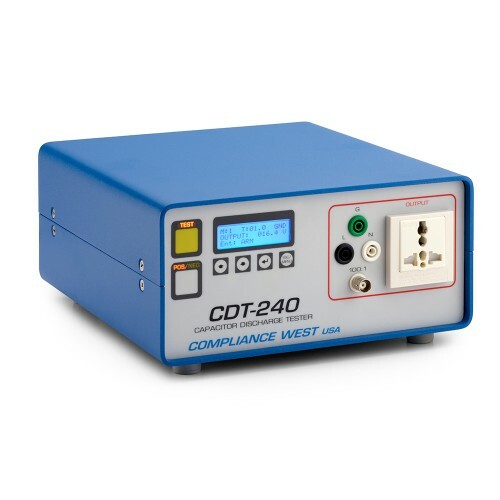 The CDT-240 disconnects the line at the voltage peak and analyzes results to the requirements of various Standards, allowing quick results. Scope output for viewing decay waveform. Presets for EN 61010, EN 60065, EN 60950, EN 60601-1 and EN60335. Recommendations for Pluggable Type B equipment. NIST calibration supplied; A2LA calibration available. 15A option for testing large equipment. Accurate; in accordance with CTL voltage and time specifications. Tests Line-Ground, Line-Neutral and Neutral-Ground. Micro-controller Technology, one button test, easy setup, LCD display indicates test results. Maximum Rated Test Current 8A, 15A optional. Ergonomically designed for safety, speed and efficiency. Designed for product development, production and laboratory use. Rugged construction that can withstand a 6" drop with no damage. Cables, manual and calibration certificate included. Fuse 10A, 250V, time delay, 1-1/4" x 1/4"